According to the Michigan State Police, in every county in the region in 2013 the percentage of reported female victims was higher than the percentage of reported male victims. One reason for this is because men and boys are less likely to report domestic violence. Wayne County had the highest percentage of female victims in the region at 75.7%, along with the highest rate of domestic violence incidents. In Southeastern Michigan, the most common relationship a domestic violence victim had with their abuser was being their was their boyfriend or girlfriend; in some cases the relationship also involved living together. Although this was the most common relationship, it does not discount the victims who experienced abuse from their spouse, child, sibling, parent, grandparent or grandchild. Domestic violence victims tend to have long-term relationships with their abusers. In 2013, Wayne County had the highest rate of domestic violence incidents in the seven county region at 1,349.5 per 100,000 residents. 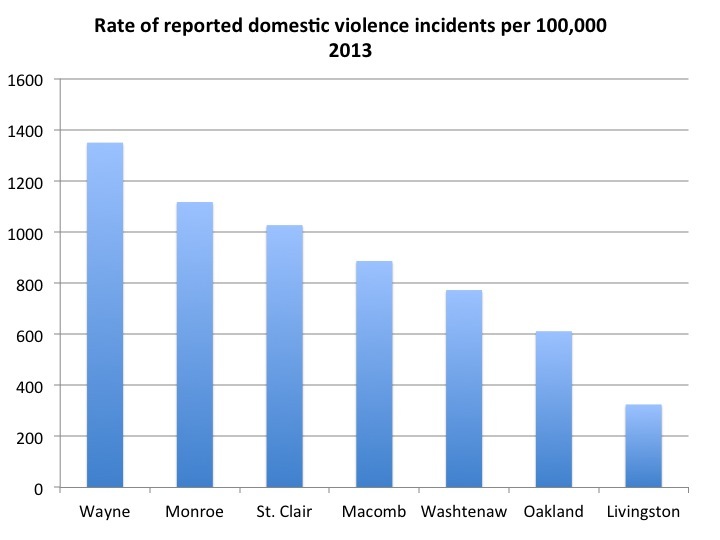 The other two counties in the region where the rate of domestic violence incidents was above 1,000 per 100,000 residents were Monroe (1,117) and St. Clair (1,026.7). Livingston County had the lowest rate of domestic violence incidents in 2013 at 324.9 per 100,000 residents. The rates were calculated using the number of reported domestic violence incidents, according to the Michigan State Police, multiplying that number by 100,000 and then dividing it by the 2013 county population estimates from the American Community Survey. In addition to having the highest rate of domestic violence incidents, Wayne County also had the highest number of reported domestic violence incidents in the region in 2013: 26,521. Monroe County had the second highest number of reported incidents with 1,698. Livingston County had the lowest number of reported domestic violence incidents at 588. When examining the reported domestic violence incidents by the gender of reported victims, in 2013, Wayne County had the highest percentage of female victims at 75.7 percent, while Monroe County had the highest percentage of male victims at 32.2 percent. Subsequently, this means Wayne County had the lowest percentage of male victims at 24.2 percent and Monroe County had the highest at 32.2 percent. Livingston County had the second highest percentage of male victims at 31.8 percent. Monroe and Livingston counties were the only two in the region where the total percentage of reported female victims was under 90 percent. The MSP break down victim-to-offender relationships into 20 categories. Above are the top five most occurring categories of victim-to-offender relationships in 2013 in the region, according to the MSP. For the boyfriend/girlfriend category and ex-boyfriend/girlfriend category this includes couples who currently or did live together and homosexual couples. Of all the types of victim-to-offender relationships that existed in reported domestic violence incidents in 2013, the most common in all seven counties was a boyfriend/girlfriend relationship. In Wayne County, the boyfriend/girlfriend category represented 8,498 of the total 27,297 reported relationships, or 31.1 percent, and the ex category accounted for 4,570 of the total reported relationships, or 16.7 percent. Washtenaw County had the second highest percentage of boyfriend/girlfriend victim-to-offender relationships with 805 of the 2,740, 29.4 percent, representing this category. Monroe County had the lowest percentage of boyfriend/girlfriend victim-to-victim relationships at 21.4 percent; this percentage is reflective of the 374 of the 1,745 reported boyfriend/girlfriend relationships. When not comparing percentages, Livingston County had the overall lowest number of boyfriend/girlfriend victim-to-offender relationships at 138. There were 603 total reported relationship making the boyfriend/girlfriend victim-to-offender relationships equal 22.9 percent of the total reported relationships. Other relationships the MSP categorized, aside from the ones represented in the chart above, include: grandparents, grandchildren, parents, step-parents, children and siblings, ex-spouses, and common-law spouses. Note that the number of victim-offender relationships in the chart above is not equal to the number of victims shown in a prior map ,because there were incidents where there were several offenses, but only one offender, according to the Michigan State Police. ← How many structures in Detroit are blighted and ready for demolition?